In 1968, the Hot Wheels brand came out swinging with the famous Sweet 16 set of 1/64 diecast toy race cars, and with a track set to match for high-speed play, the bar was set massively high for 1969. Not just for their rival, the previously dominant Matchbox, but for themselves. With Harry Bentley Bradley, the designer of 11 of those cars, not seeing much opportunity in the rest of the line, he declined an invitation to return to the drawing boards at Mattel, instead suggesting another designer from the car industry, Ira Gilford. Ira Gilford then proceeded to kick things off with what would become some of the most recognizable and iconic vehicles in the toy industry, let alone the Hot Wheels repertoire. Chief among those is the ever-enduring 1969 Twin Mill, a sleek, powerful beast that combined the smooth curves of a concept car with the raging American muscle that was the trademark of HW at the time. Many real cars undergo later revisions and re-releases, but the Twin Mill outright got sequels, with 1993's Twin Mill II and 2008's Twin Mill III each adapting it to their respective eras. It’s tough to deny the original is timeless, though. This is a design that you can absolutely tell was made for the toy plastic track, not the road. You might come to that conclusion from the aerodynamic design, the outlandish double engine combo, the lack of headlights, but no, when you look in at that neatly shaped interior and see the seats, that’s when the real worry may hit you; from the driver or passenger side, you cannot see out the window past the engines. They are directly in the way. This isn’t a car you can just go to any given car lot and buy, of course (usually), but there is a real official 1:1 scale Twin Mill from 1998. Runs on pump gas, the twin-supercharged big-block Chevrolet engines really work, added headlights and taillights for obvious safety reasons, the whole nine yards. 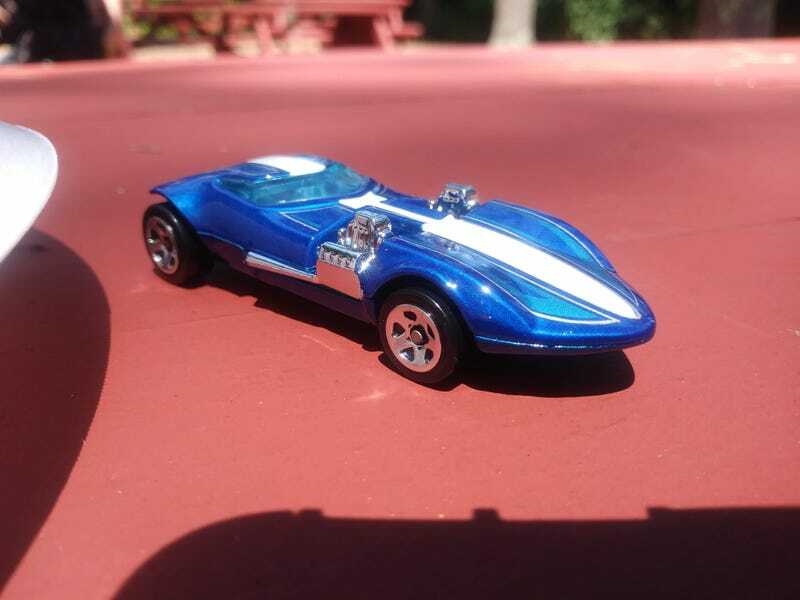 Unlike many of the 1/64 scales, this was made after the toy, and provides a weird question, with the card art being of the 1:1 design; is the toy inaccurate to the real car, or is the real car inaccurate to the toy? This is a 2018 release of the 2014 update of the 2011 casting of the 1969 casting. Simple, right? In any case, no matter which form it takes, or which of the countless releases and re-releases it is, the Twin Mill is always unmistakably the Twin Mill. It’s a distinct and truly badass design that I don’t think people will ever truly get enough of. I know I sure can’t. I’m glad its popularity extended to at least when I was growing up; I’m able to still treasure it as something from my childhood, when it’s been a part of childhoods and collections for nearly 50 years now. Parked cozily on my temporary desktop parking lot. Sure as heck stands out in a crowd.